Overview. This selfbuild project was concieved about 6 years ago, at which time it seemed sensible to work with stud frame systems. That was before a good friend handed me copies of Tedd Benson's books on timber framing, eh voila! 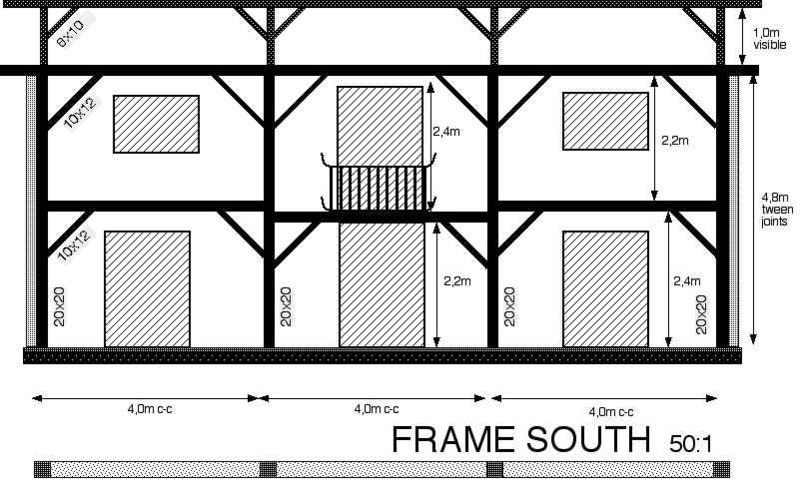 While timber framing may introduce some complexities, this saltbox design otherwise attempts to simplify things; it has a rectangular layout, a two-pitch roof and an un-interrupted wet-wall between living and storage space to carry plumbing without fuss. We tried to plan for everything, but the design was fixed and accepted with the planners well before Rohan put a twinkle in his Mum's eye! 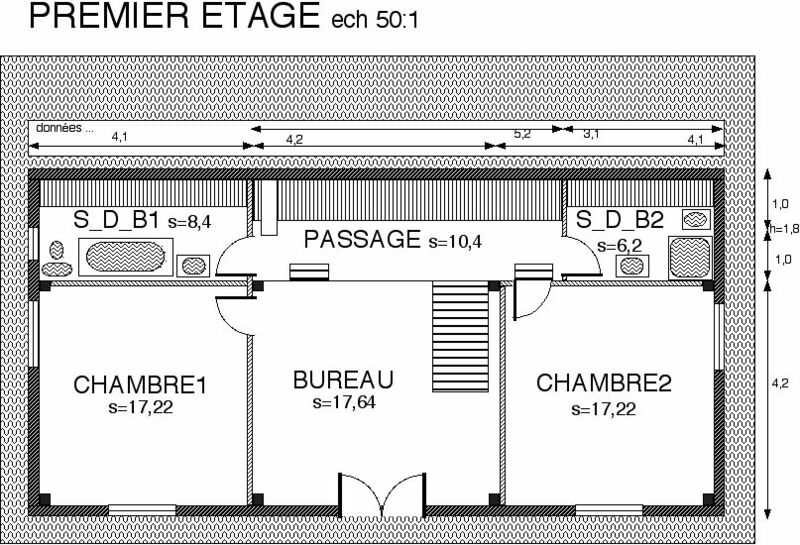 Floor-plan for the lower floor. Labels in french, dimensions in metric. Floor-plan for the upper floor. Labels in french, dimensions in metric. 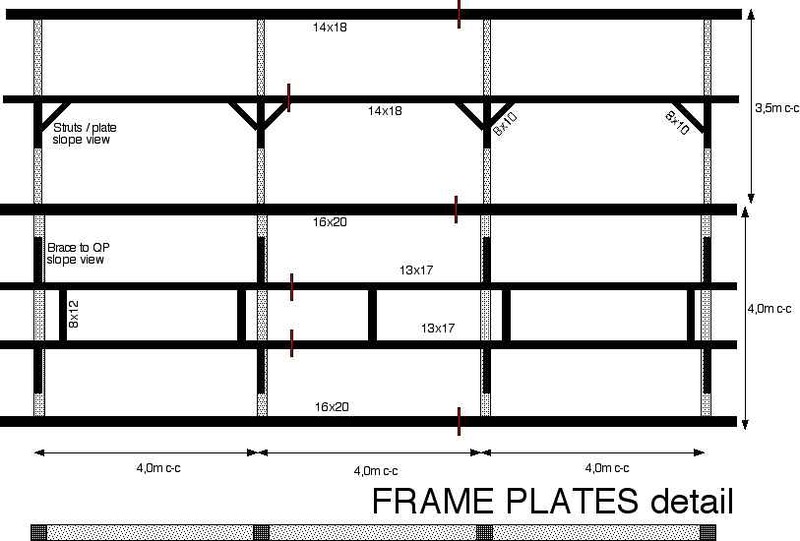 Frame West. 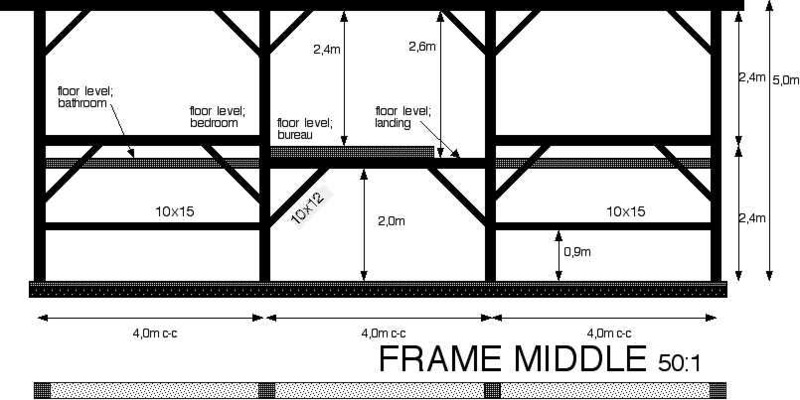 Since stud walls will box in the long rear storage room, it is intended that these will support the upper floor above, leaving the frame beams to carry only roof loads. 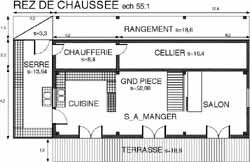 The upper floor at rear is offset lower to gain head-height. 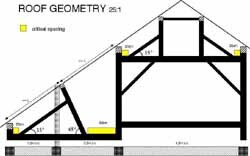 Roof angle is 35º or 7 in 10. Frame Roof Geometry. 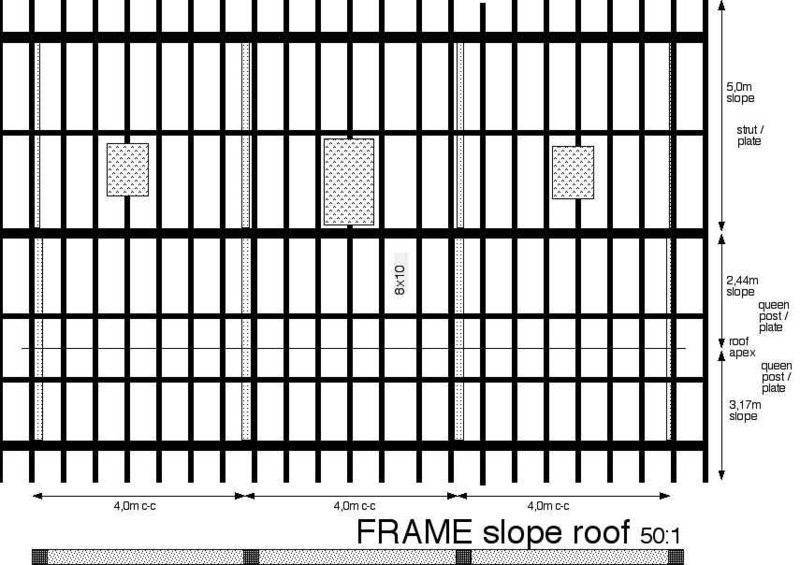 Exact scaling to specify roof members. Queen posts are spaced to place equal 2-pt load on girt. The strut has settled at 65º to avoid conflict with wall-structure and place the plate at mid-span. 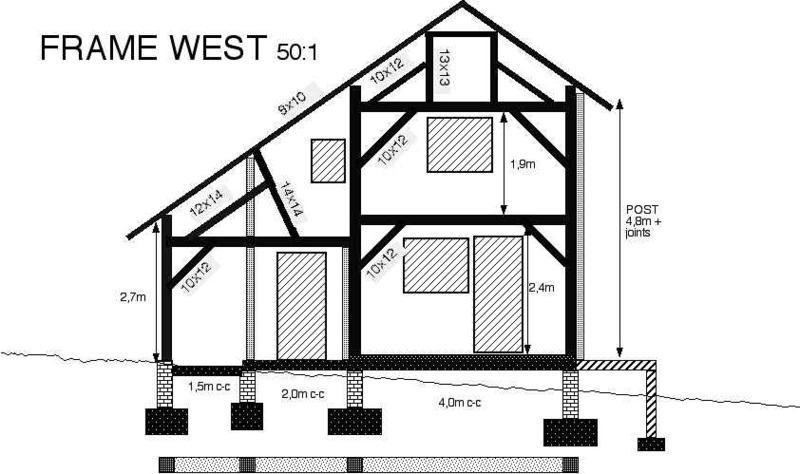 Extra wood between girt and plate joints results in greater strength; an extra 10cm headroom in the bathroom (under shed roof) won't go amiss either. 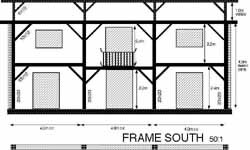 Frame South. Hatched window boxes are placed to verify clearances. Longer braces will be used where possible to add stiffness; we're in zone 2b for seismic activity here! 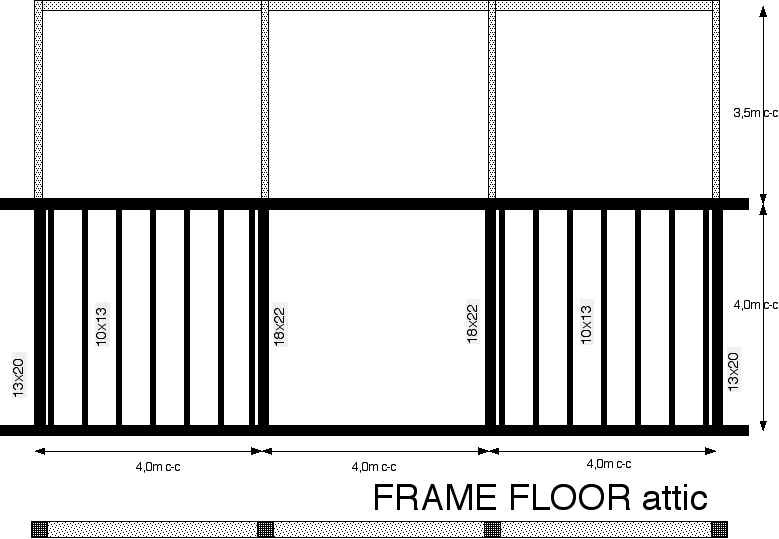 Frame Middle. 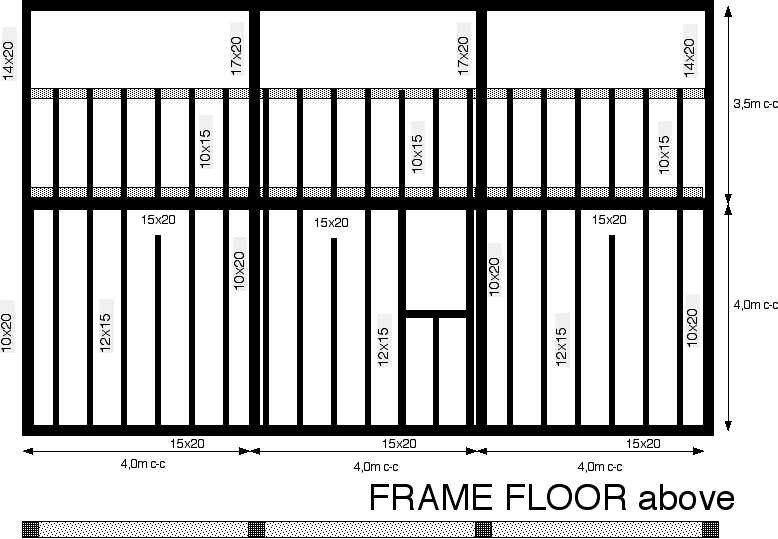 Attempts to show the three floor levels which will allow less reduction of post section due to mortising. 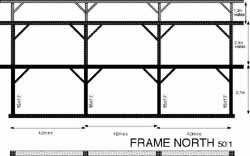 Frame North. 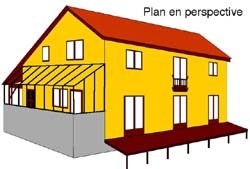 Frame members in three different planes shown. 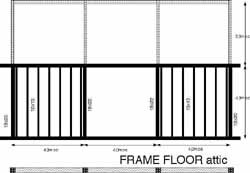 Frame Floor Upper. Checked for deflection at 1/360th. 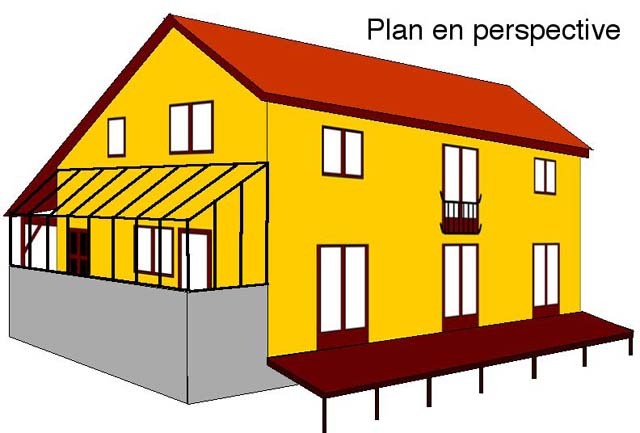 Note internal girts under the shed roof are proportioned to take nearly double roof loads transmitted through the canted struts. 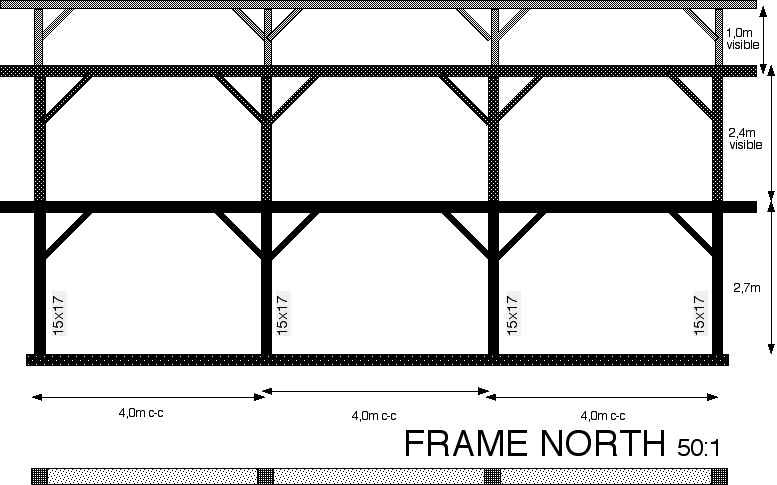 Joist systems oriented to allow 'flying-in' after assembly of tusk tenon joints. 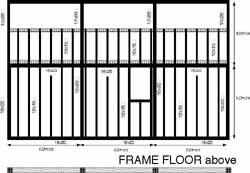 Frame Floor Attic. Checked for deflection at 1/240th. Note internal girts are proportioned to take nearly double roof loads transmitted through Qeen Posts. Note roof frame members (QPs, plates and braces) will be open to view in middle of house; the bedroom roofs will be easier to insulate. 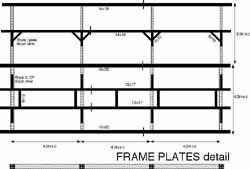 Frame Roof Plates. Scarf joint positions indicated by red markers. The inter-leaving adds strength (thankyou to advisors!). 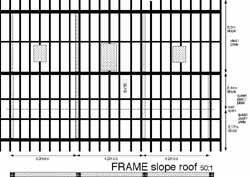 Frame Roof Slopes. 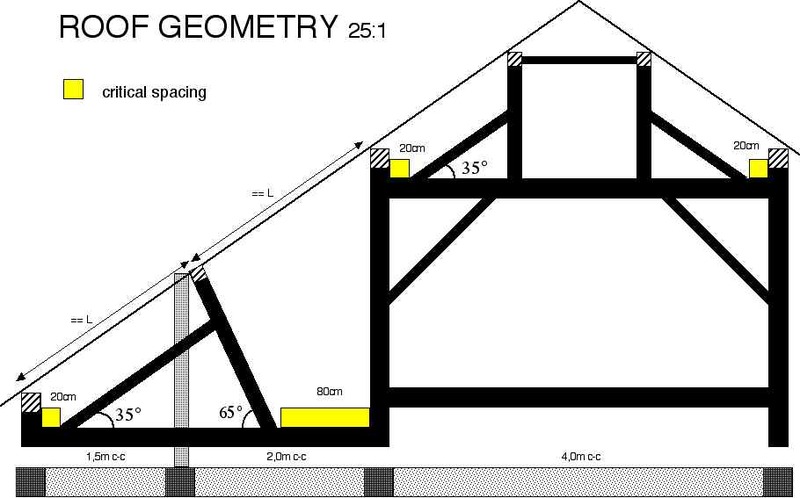 Rafters at 60cm spacing. Wood choice. I would like to have used the locally available chestnut (castanea sativa) through-out; it is well resistant to insect attack and to wetting, and is generally attractive. Its characterfullness may however conflict with structural demands, and it is more expensive than douglas, which holds the further advantage of being lighter. 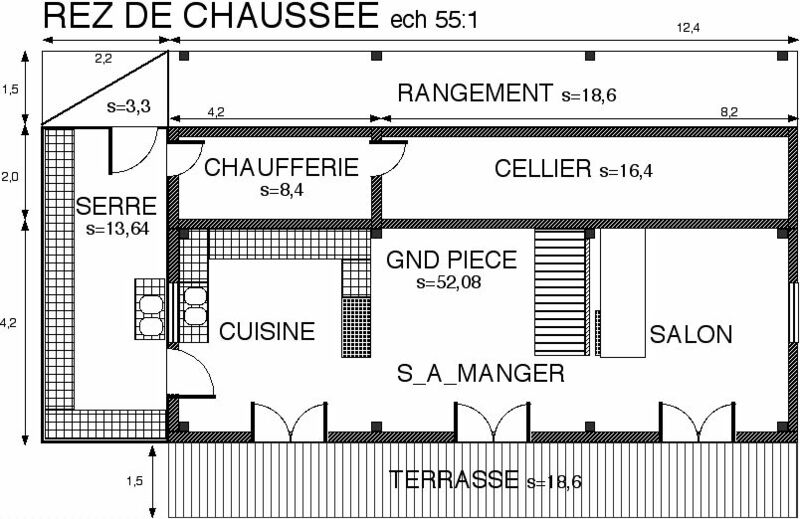 So douglas is the main choice, but since the short posts on the N side of the building are exposed to the weather, chestnut will be used for them. Minor representation of other wood species comes in oak for the splines, and acacia for the pegs. Click here to check out joint selection.